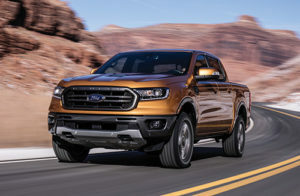 The all-new 2019 Ford Ranger is making a strong bid to be the No. 1 mid-size pick up this year. It is definitely a serious player in the mid-size truck segment. Nearly everything is new about the 2019 Ranger and it leads the pack with its unique design and amenities. The Ranger uses a heavily revised version of the architecture Ford uses for mid-size pickups built and sold around the world. The steering is quick and responsive, but doesn’t feel jittery over rocks or plowing through mud. Ford’s engineers developed the steering and chassis with great off-road characteristics. The on-road ride is smooth with a full load or empty. The payload is 1,560 pounds for the 4WD crew cab. The Ranger’s EPA fuel economy ratings are also competitive. Rear- drive models scored 21 mpg in the city, 26 on the highway and 23 combined, while four-wheel drive notched 20/24/22. 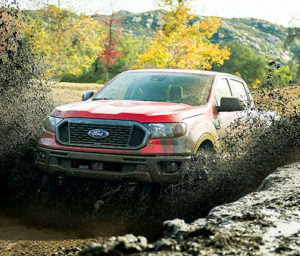 The Ranger’s front has a slight dip, which helps its handling on the road and is meant to improve its driving dynamics. Ranger’s front end gives the truck a more horizontal stance. It can be parked and navigated into some tight parking spaces. Power comes from the proven 2.3L turbocharged four-cylinder engine Ford already uses in the Mustang and other vehicles. This motor has 310 pound-feet of torque with amazing acceleration and towing capability. 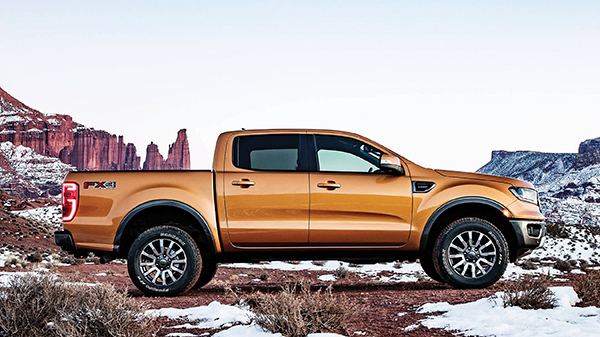 The Ranger comes with a 10-speed automatic transmission. The interior design and controls of the Ranger are straight out of the F-150. Highlighting the Ranger is a big touch screen; dials and buttons for climate with an excellent voice recognition system. The seats are very supportive and comfortable. A rotary knob controls the state of the 4×4’s transfer case, and it includes a neutral tow mode to enable four-down towing behind a motorhome. Buttons to enable Trail Control and hill descent control and the locking rear differential are nearby. The 10-speed’s console shifter employs a straight-pull design, that makes the Ranger unique in the mid-size truck category. 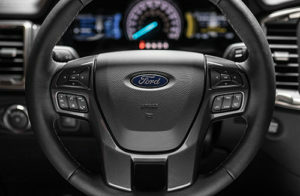 The centerpiece of the infotainment system is Ford’s impressive Sync 3 architecture, and among other things, that means the Ranger will support Apple CarPlay and Android Auto. There are two console-mounted USB ports. Other options include Ford+Alexa enhanced voice control, built-in navigation, and a B&O Play by Bang & Olufsen premium sound system. Automatic emergency braking comes standard along with lane departure warning with lane keeping assist, a reverse proximity alert system, and a blind-spot monitoring system than can be configured to account for an attached trailer. Highlighting the suite of safety features in my test drive Lariat was adaptive cruise control and enhanced automatic emergency braking with pedestrian detection. The 2019 Ranger features a rounded front fascia that shares its basic theme with the Ford Edge crossover SUV. Headlights protrude out from a wide grille highlighted with a big Ford blue oval and the word “Ranger” stamped into its plastic. A deep cut into the lower doors gives the Ranger more visual flair from the side than its slab-sided competitors. At the rear, its tailgate features the big Ranger logo. Our test vehicle was a crew cab, which featured a 5-foot bed and front-hinged rear doors. • Airbags – Dual-stage driver and right-front passenger front. • Airbags – Front-seat side. • Airbags – Safety Canopy System with side-curtain airbags and rollover sensor. • Remote Keyless Entry with remote tailgate lock (XL and above). • SOS Post-Crash Alert System. • Tire Pressure Monitoring System (TPMS; excludes spare). • 110-volt Power Outlet – Rear Flow-Through Console. • Dual 4.2″ Productivity Screens. • Pre-Collision Assist with Automatic Emergency Braking. • Blind Spot Information System with Cross-Traffic Alert. •Color-coordinated carpet with carpeted floor mats. • Floor Mats – Carpeted with Nubuck edge and Ranger Logo. • Flow-through center console with floor shifter. • Grab handles (A-Pillar) – Front, Passenger-side. • Intelligent access with push-button start. • Powerpoint, 12v – Front, Two (2). • Powerpoint, 12v – Rear. • Forward and Reverse Sensing System. • Steering wheel – Leather-wrapped. • Steering wheel, manual tilt/telescoping. • Visors with driver- and passenger-side illuminated, covered mirrors. • Speakers – 6 Audio Speakers. • FordPass Connect with 4G LTE Wi-Fi hotspot. • Front head room: 39.8 in. • Front leg room: 43.1 in. • Front shoulder room: 56.7 in. • Rear head room: 35.9 in. • Rear leg room: 34.5 in. • Rear shoulder room: 56.3 in. 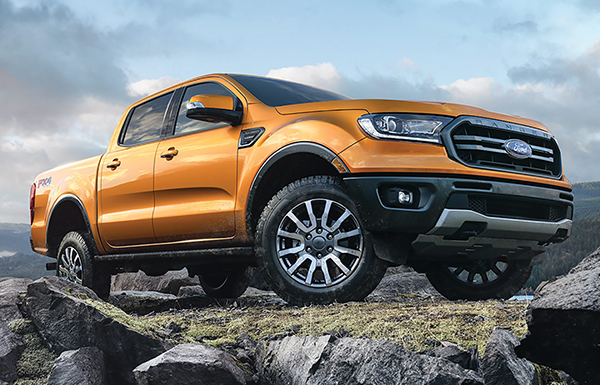 If you are in the market for a mid-size truck, head down to your local Ford dealer for a test drive of the new Ford Ranger truck today.